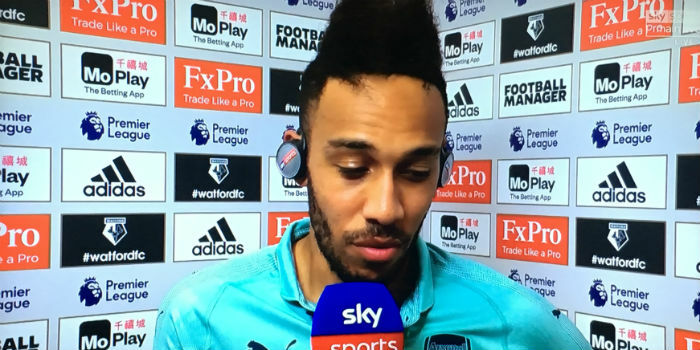 Match-winner Pierre-Emerick Aubameyang faced the Sky Sports cameras after he helped Arsenal to a vital 1-0 win against Watford, a result that takes us back into the top four and marks our first clean sheet on the road. Here’s what the Gabon international had to say about his goal, the performance and his chase for the Golden Boot. It feels good tonight because we know away it’s always difficult for us. Today the team did a great job and everybody fought to have these three points. Tonight we are really happy. We knew that it would be a tough game. I think everybody knows what the target is for us this season; to get the top four. We knew this game was really important to stay in the competition for the top four. Everybody fought today, we did a great job. I was confident. It’s a long time I wanted to score a goal like this. Tonight, it went through. I was confident. Normally keepers, they don’t really know if you’re coming back to them. Tonight it was a good goal for me, I like it. Yeah, why not. I feel confident. The race is going on. I know it’s a tough battle. I’m confident that I will carry on. It was a great goal from Mo Salah, an unbelievable goal. I like sometimes [to score like this], it’s not maybe easy, but it’s easier than Mo’s. I feel good. It’s tough to play in the Premier League, as you can see tonight. It’s a tough game, you have to fight every game, but I feel well, I feel good. I’m feeling well in the team, since I’m here I’m feeling happy. This three points gives us a lot of confidence. Now we know that we can win games away. We have two more games at home but more away. It’s great tonight to get the three points and to go home with the victory. Would love him to get the Golden Boot. I think it’s his fourth or maybe fifth: French, Spanish (I think–his mother is Spanish), Italian (mostly grew up there), German. Not a great game by any stretch of the imagination. We huffed and puffed against a determined Watford in spite of having more men for more than 70 minutes! I expected more goals after the sending off. However, the three points are most welcome. But how likely is it that we’ll keep a top four place on the type of away performance we’ve seen against Everton and Watford? Hopefully, it will give players confidence but both performances were pretty dire if we’re honest. I doubt we’ll get three points away from The Emirates playing like that again this season. We will have to improve on the road or the Top Four beckoning will turn out to be waving us goodbye! Man United was totally outplayed (at home!) by West Ham and got the points. It happens like that sometimes. We really have some “away” demons. To think we were a man up and still played with so much pressure against a team outside the top six tells a lot. I believe we ha e what it takes to get over the line. Had my heart in my mouth throughout the entire match. Thank God that I didn’t end up with a heart failure. With the three points in the kitty, it was all worth it, but we could have done a better job of it. I was wondering what all his pace was about. More a case of Foster dawdling IMO. Auba is a poacher but Laca makes things happen, is more proactive. Shout to Mutsafi, plenty of headed clearances, put his head on the line before one of their lot could pull the trigger in the box, plus a couple of important clearances. Great sliding tackle out wide to win the ball and retain it in first half but then Mhkitaryan lost it. Also played the ball forward quickly when he was at Rback. Some people choose to highlight his faults and quietly let his merits go unappreciated. This sort of nonsense does not help with objective viewing in the team’s true issues. Great way to get that goal, he has been trying to run towards the goalkeeper so many times this season and he got one for that run and pace. But Auba’s finishing diminishing game by game, that’s really worrying thing. Hopefully he will get few more goals and get us into the champions league. Yes, it has. Yes again, it’s worrying. Hopefully it will all work out good in the end for everyone.